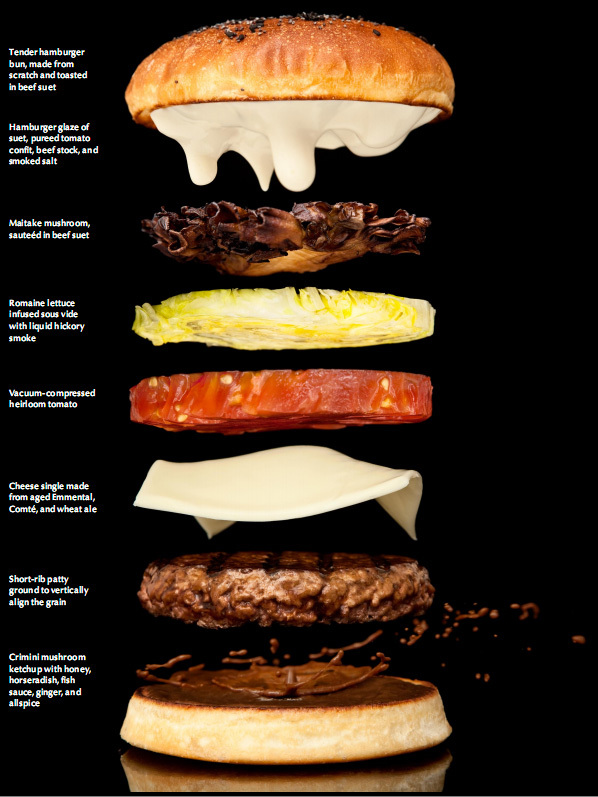 In The Ultimate Hamburger, scientists and cooks Nathan Myhrvold and Maxime Bilet of Modernist Cuisine describe in detail how they created their “ultimate hamburger”. Modernist Cuisine recently published a high-end 6-volume book set, titled Modernist Cuisine: The Art and Science of Cooking, which is described as “a work des­tined to rein­vent cooking”. In Modernist Cuisine: The Art and Science of Cooking, Nathan Myhrvold, Chris Young, and Maxime Bilet—scientists, inven­tors, and accom­plished cooks in their own right—have cre­ated a six-volume 2,400-page set that reveals science-inspired tech­niques for prepar­ing food that ranges from the oth­er­worldly to the sub­lime. The authors—and their 20-person team at The Cooking Lab—have achieved astound­ing new fla­vors and tex­tures by using tools such as water baths, homog­e­niz­ers, cen­trifuges, and ingre­di­ents such as hydro­col­loids, emul­si­fiers, and enzymes.